The Washington Post’s coverage of Israel: Slouching towards the Guardian? Something strange is happening at the Washington Post. Famous for its investigative reporting ever since the Watergate affair, now, when reporting on Israel, it seems to have become strikingly similar in content and tone to the Guardian. As we know, the Guardian recently won Honest Reporting’s 2011 ‘Dishonest Reporting’ Award and the Washington Post seem to be on its way to becoming a serious candidate for the same “honor” next year. Take the recent story in the Washington Post about Israel’s use of drones over Gaza to identify terrorist activity. 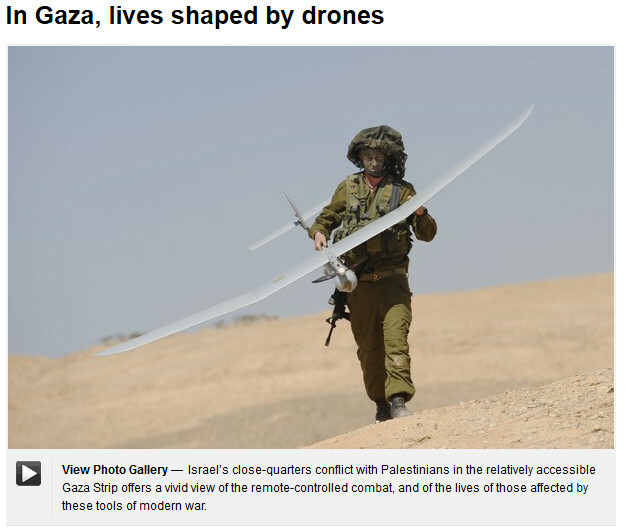 The web version appears at: In Gaza, lives shaped by drones. 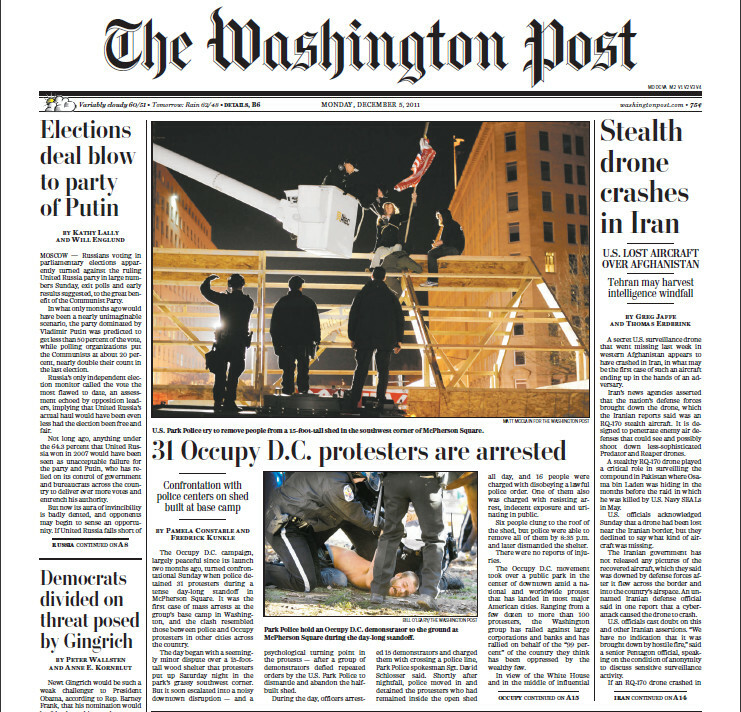 The print edition ran as a front page, above-the –fold news story. In fact, it occupied almost the entire front page, which is quite unusual for an article that does not contain breaking news or an investigative report. Since this area is the first thing readers see when they pick up the paper editors will reserve that space for their most important stories. 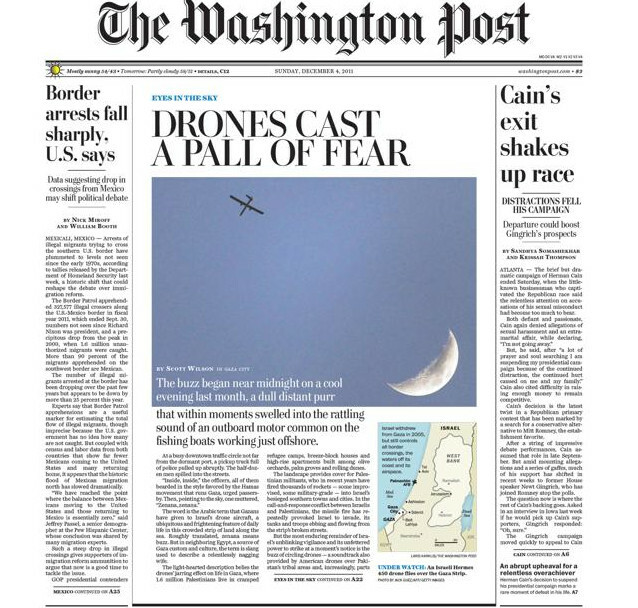 This is what it looked like in the print version, under the very different headline: DRONES CAST A PALL OF FEAR”. The story ran for another two full pages inside the paper: Here, here and here. The article and web version are eerily reminiscent of the Guardian’s reporting. The entire article focuses entirely on the attitudes of seemingly peaceful Gazans going about the normal things people do – going to cafes, driving their cars, jogging. There is a little map to show where the drones are supposed to originate from, and on the web there is a video clip of a drone with the legalistic caption “a third-party video that has not been independently verified by The Washington Post” and a gallery of pictures intended to show drones and their effects. The Palestinian Center for Human Rights says 825 people have been killed by drones in Gaza since the capture of Shalit, who was released in October. Most of those killed, according to the organization, have been civilians mistakenly targeted or caught in the deadly shrapnel shower of a drone strike. When an Israeli strike is carried out it is carried out by a plane or helicopter piloted by a human being who has the authority to abort the mission if he or she believes it will endanger civilians not connected with the terrorist activity. Israel makes extraordinary efforts to avoid killing civilians despite the fact that Hamas and other terrorists deliberately operate from residential areas while firing missiles into Israel. By comparison, the New America Foundation says U.S. drones have killed at least 1,807 militants and civilians in Pakistan since 2006. Suffice it to say that I have never seen a full-page article about “the pall of fear” in Afghanistan, Pakistan, Yemen, Somalia, or elsewhere that US drones operate. It is worth noting that according to the dates provided, over the same 5 year period US drones, which are far larger than Israeli drones and are weaponized, are claimed by a US source to have killed more than twice as many people in only one of the countries in which the US is operating against groups similar to Hamas. The overall total must be higher. On the same front page of the Washington Post, two stories that should be of far greater interest to the US reader are literally pushed to the side – Herman Cain’s resignation from the presidential race, and the ongoing issue of illegal immigration and border arrests. As it happened, another drone story surfaced shortly afterwards – the downing or crash of a US drone in Iran. This drone story first appeared in a side column above the fold on the front page. While there have been numerous follow-up report in the Post about this issue, including Obama’s abject request for the Iranians to return the drone, none of the reports discuss US drones “spreading a pall of fear” over any country in which they fly. In fact, quite rightly in my opinion, drones are regarded as a relatively low-cost, effective way to prosecute a campaign against distributed terror organization hiding out in inaccessible regions. However there are no articles that seriously suggest, for example, that the US should not be over flying and killing people in countries with which it is not technically at war, while Israeli surveillance activity over Gaza, from where rocket are fired daily into Israel, is clearly being portrayed as illegitimate by Scott Wilson. The Washington Post has also become adept at picking up the same negative stories about Israel, probably from the same Arab sources, that the Guardian publishes day after day. For example, Joel Greenberg wrote an article that clearly derives from the same source as Harriet Sherwood’s article about relocating the Bedouin near Maale Adumim. (The Bedouin have become the new front in the media war to delegitimize Israel). Read Sherwood’s article, Israel to forcibly remove bedouin communities in settlements push and compare it with Greenberg’s report on the same matter: Israeli plan to move West Bank Bedouin stirs controversy . While not word for word, and more nuanced than Sherwood’s even in the headline, the thrust of the article is the same and the “facts” reported are clearly rewrites of material from the same source – almost certainly a Palestinian or anti-Israeli NGO organization, or, as cited by Greenberg, UNRWA, which now appears to regard Bedouin as having being transmuted into “Palestinian refugees” in its never-ending efforts to justify and expand its unique role in creating ever more refugees, generation after generation. There are slight differences in the language but the overall “facts” presented are the same. Israel’s claim that moving people squatting in shacks to areas where there is electricity, running water and sewage facilities is scornfully cast aside in favor of a clear implication that this is ethnic cleansing, backed up by uncorroborated claims of such from unnamed “UN agencies in the West Bank” other than UNRWA (Greenberg) and, of course, various “human rights groups”. In both cases, there is a clear implication that connecting Maale Adumim to greater Jerusalem will bisect the West Bank, which is, of course not true. There will still be a corridor of about 15 km between Maale Adumim and the Jordan Valley – about the same width as Israel at its narrowest point opposite the West bank. The same story about a school built of old tires appears in the text of Sherwood’s article and as a caption to a video clip on the Washington Post’s web version of the story. In both articles, the idea that people should not simply squat wherever they wish, something that is not tolerated in the US or the UK, is never mentioned. Instead, a sense of some historical right to do so is invoked and the destruction of a noble nomadic culture is implied. The coverage of Israel in the Washington Post is becoming increasingly and obsessively negative, as is the Guardian’s. Here is a short list of articles just by Joel Greenberg, who seems to be a combination of the Guardian’s Sherwood and their new reporter from Ramallah, Phoebe Greenwood. The articles the Washington Post publishes about Israel are unlike those it reports about any other country, just as we have seen with the Guardian. Something is happening at the Washington Post, one of the world’s most influential newspapers situated in the heart of the US capital, and it bears watching. And the photo tries to evoke the islamic crescent moon. Very subliminal. Israel is losing friends right, left and centre. Ever asked yourself why? Ever asked yourself why you can’t address the substance of this latest smear against Israel– the fact that the Washington Post Article falsely ascribes deaths to Israeli drones, when they are not even armed? But something as simple as the facts of the case has never bothered the haters of Israel for one moment. They pile smear upon smear, until it seems self-evident that Israel must be destroyed. That is the game they are playing. I would ask an other question – which friends are we losiing? Yet “progressive” socialists CONTINUE to support islamofascists. You’ve listed 7 events which have nothing to do with Israel. Unanswerable because irrelevant. Q. Which group IS responsible for the above 7 events? If true, I stand corrected. However, I regard Ha’aretz only marginally more accurate as an unbiased source than Wikileaks. The cable you refer to is a summary of reports about investigations into Cast Lead, not ongoing operations in Gaza and is the only authentic example I can find after researching your response of any Israeli Moreover, there are no verifiable reports of 825 people being killed by Israeli drones and Wilson provides nothing to back up his claim. The circularity of these reports is astonishing. “The Palestinian Center for Human Rights says more than 800 Palestinians, mostly civilians, have been killed in Israeli drone strikes in the Gaza Strip over the past five years. So now the number provided by the Palestinian Center for Human Rights that was cited by Wilson has been granted authentic status because “the Washington Post reported” it. This is the same sort of reporting that created the Al Durrah affair and the Jenin Massacre libel – the lies get reported in the Western press, and then cited by those who invented them as proof that they are not lies. The truth is that, if the wikleaks report is even true and not faked, Israel has almost never – maybe once – used drones to attack targets, and as Press TV is forced to report, uses them as spotters for attacks from piloted vehicles. This is a drag. Now that the NYT will be by subscription for all starting on January 1, I was planning to read the WP more often. If the NYT will be by subscription for all, then it will be as successful as the paper version with declining number of readers. The front-page placing for this dogdy drone story is quite remarkable, AKUS — thanks for highlighting this. Re. Israel’s “assassinations”, obviously the drones are used to identify rocket crews getting ready to target the roughly 1 million Israelis who live under the “pall of fear” cast by the constant bombardment of their towns and villages by Gaza terrorists.